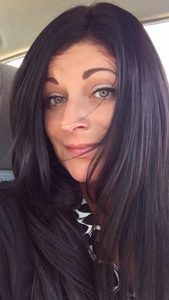 She called late one night to our Indulge Salon South location asking for help to fix her orange shaded highlights that anothe stylist did. 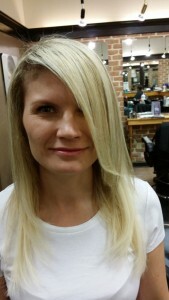 She came to us from a client referral that trusted we could do great things with her hair. 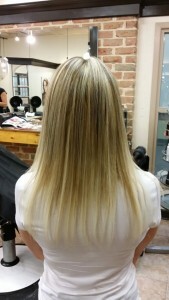 After her thorough consultation, we decided we would neutralize the brassy highlights with a pretty light cool blonde. The result was gorgeous! 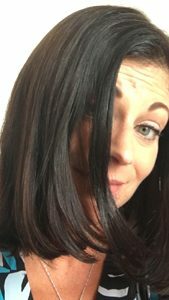 She knew that she would have to baby her hair and one of the solutions to her fine, broken off hair around the nape (neck area) and the front from over highlighting and not being applied properly over the years, I offered FUSION hair extensions. This type of hair extension would be fused to her natural hair giving her fuller, healthier looking hair. We gave her some longer side bangs that really set her look off. 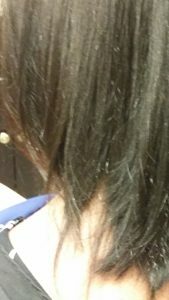 Part of the reason we gave her hair extensions is the prevention of anymore hair breaking from pulling it up while she works as a nurse. She needed something easy to manage and she finally found it with thicker, stronger hair and the right shade of cool blonde. 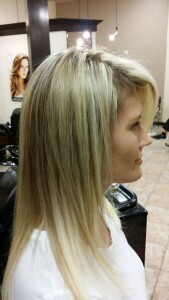 Cindy Wycheck from York PA came in for hair extensions recently after a wild night out with some of her girlfriends. After having a few drinks her girlfriends thought it would be a good idea to give Cindy a haircut. Unfortunately fuelled by a few too many drinks the girls thought there hair styling skills were a little better then they turned out to be. Fortunately Cindy gave us a call and visited us in the Salon. To fix up the style and restore Cindy’s look to her previous, beautiful look I did a combination of fusion and tape-in hair extensions. The results as you can see below speak for themselves.